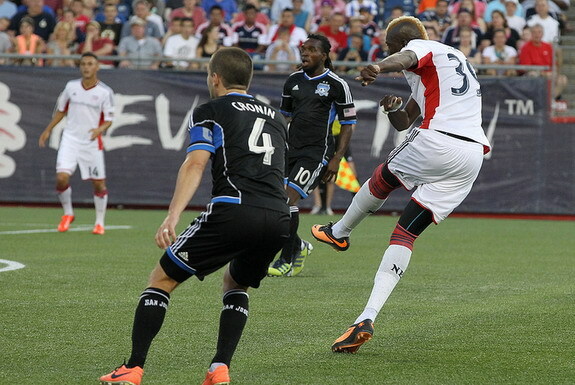 Saër Sène scored a knuckling long-range rocket as the New England Revolution earned a 2-0 win over the San Jose Earthquakes on Saturday night at Gillette Stadium. The French striker opened the scoring on 13 minutes after a sequence he started with his own attempt on goal. Sène found space outside the Earthquakes penalty area and tried to curl a shot into the far corner. Earthquakes goalkeeper Jon Busch was able to punch the shot away, but it went as far as Revolution defender Chris Tierney, who headed the rebound to Lee Nguyen. Nguyen then touched the ball to Sène, who unleashed a left-footed rocket from outside the box that flew past Busch and under the crossbar. The Revs wrapped up the win in the 78th minute when Dimitry Imbongo climbed off the bench to stab home Nguyen's pass from close range. "The goal came from the right side, like we work in practice," Sène said in his post-match interview. "I don't know who gave me the first ball but I received the ball and I shoot. The goalie saved it the first time but the second time, Lee gave it to me back, and I shoot again on scored. "I like to shoot from far away. I don't like to think too much. When I am on the field, I am trying stuff and I'm happy that tonight was successful."